The American robin (Turdus migratorius, Fig. 1), is one of the most familiar, widely distributed, and adaptable songbirds in Maine. It is equally at home in city parks and gardens, rural farms, manicured lawns, and woodland edges. 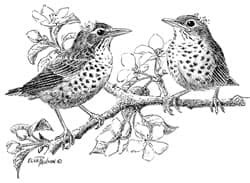 It is a member of the thrush family, Turdidae, which also includes species such as the Eastern bluebird (Sialia sialis) and hermit thrush (Catharus guttatus). It was named by English settlers who believed it closely resembled the European robin (Erithacus rubecula), despite the fact they are not closely related and belong to different families. Robins are probably the most abundant and widespread inland breeding bird in New England's settled areas, but the species is becoming more scarce in heavily forested areas. While many robins migrate to the southern United States for the winter, some do overwinter in Maine. In late summer and continuing on up until the breeding season begins in spring, robins may form nomadic flocks that roost together at night and feed together, seeking fruit-laden plants by day. Robins hunt on lawns, pastures, fields and meadows, often hopping a few yards and then standing still with their heads cocked to one side as though listening for their prey, but actually discovering it by sight. With the decrease of available insects in fall and winter, robins feed on ripe fruits and berries in trees and shrubs. Robins nest in deciduous and evergreen trees, shrubs and hedges, as well as under bridges, on windowsills, and on other ledges. They may build their nest on top of a nest from the previous year. Robins nest early in the year. Their first nests are often placed in evergreens for protection, since deciduous trees and shrubs may not have leafed out yet. 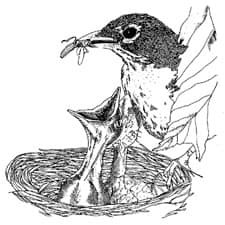 Females select the nest site and do the majority of nest building over a two- to six- day period. Nests are often placed in the crotch of a branch or saddled on a branch next to the trunk. The bird builds a bulky structure of twigs, weed and grass stems, sometimes using string or cloth. It smooths the inner cup with mud and a thin lining of fine grasses. Robins often nest in the same area, or a nearby area, year after year. Breeding activity begins in early April and runs through late July. The female incubates three to four glossy, light blue eggs for 12 to 14 days. The young leave the nest after 14 to 16 days. The parents continue to care for them for up to four weeks. Robins have two and sometimes three clutches of eggs each year, and may use the same next throughout. Robins have a high mortality rate, with up to 80 percent of the young dying each year. Tree squirrels, chipmunks, raccoons, crows, ravens and jays eat robin eggs and nestlings. In winter roosting areas, great horned and barred owls take a toll on adult robins. Hawks and falcons may also catch adults in flight. Because robins feed on the ground, both young and adult birds are vulnerable to attacks by domestic cats. In the 1950s and early 1960s, robins suffered from exposure to the insecticide DDT because they ate earthworms that accumulated high levels of DDT in their bodies. You can see robins run over the lawn in search of worms, perch and sing from utility wires, and bath in rain puddles. They will nest on window ledges, under porches and in gutters; they will even nest on platforms provided for them. After breeding season is over, robins gather for the night in communal roosts in trees, under bridges and in large open barns. These roots may contain a few birds or several hundred. 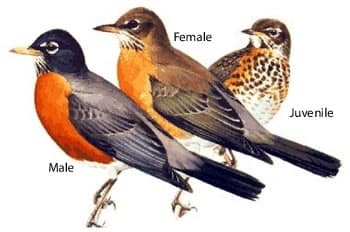 Overwintering robins generally remain in small flocks; the breakup of these flocks signals the start of the breeding season in spring. During the breeding season, a robin's territory ranges from one-third of an acre to several acres. The breeding pair spends most of its time in this area, either on the nest or searching for food. You know you are in a robin's territory when a bird gets agitated at your approach. Robins are particularly protective of their nest site when they have young in the nest. In an area with several nests, robins will come together to mob predators, such as crows, to drive them away. If a robin has a wad of mud or grass in its beak, the bird is in the process of gathering material for its nest. If a female has a line of mud across her breast, you know that she has been working mud into place with her feet and bill and molding it with her body. If a robin doesn't eat a worm or other prey immediately, but flies off with food in its beak, you can be fairly sure that it has young in a nearby nest. The tail-lift display is presented in situations of possible danger. (Fig. 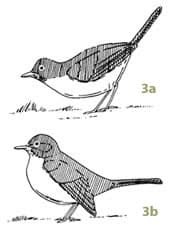 3a) The male or female robin lowers its head, raises its tail to a 45-degree angle, and repeatedly flicks its tail sharply while giving the tuk tuk tuk call. The wing-droop display occurs just before or after an aggressive encounter. (Fig. 3b) The wingtips are lowered so they droop below the level of the tail and the breast feathers may be puffed out. The male sings its song – a series of rich caroling notes, rising and falling in pitch: cheer-up, cheerily, cheer-up, cheerily – early and late in the day during the breeding season. After the breeding season, it does not sing again until the following spring, except for a brief time in the fall when the shortness of daylight simulates spring conditions. Throughout the year, the male calls teeek teeek or tuk tuk tuk in situations of possible danger, often adding a tail-flick display. Female robins do not sing, but give the alarm notes during the breeding season. Droppings contain seeds and are the color of the foods being consumed. Droppings are most conspicuous when robins are eating dark-colored berries. Avoid using insecticides. Nearly 70 percent of the breeding birds in Maine – including robins – depend on insects as a primary source of food during the nesting season. Plant and nuture trees and shrubs such as viburnum, shrubby dogwoods, serviceberry, and winterberry, as robins eat the fruits of these plants. Leave some forest floor in open soil or mulch the area with leaf litter to provide space for robins to forage. Offer wild or cultivated fruits and berries on a platform feeder. Robins learn to take currants, raisins, small pieces of dates, and other dried or fresh fruits. Let muddy areas stay muddy, thus providing a source of mud for nests. Install a birdbath in an area where it can be easily observed and maintained. Avoid pruning trees, shrubs, brambles and other likely nesting spots in the spring and early summer when robins are nesting. If you must prune at this time, carefully examine the area for nests before you begin and listen for the robin's alarm call. Keep your cats indoors and discourage other cats from visiting your property. If robins are eating fruits and vegetables: Home gardens, commercial fruit-growing farms, vineyards, and orchards often attract migrating robins. A small flock can quickly ruin or remove the year's fruit or young vegetable crop. Protect fruit crops with flexible bird netting, which can be purchased in a variety of lengths and widths at garden and hardware stores; professional quality materials and hardware are available from bird-control companies and over the Internet. Secure the base of the shrub or the tree to prevent robins from gaining access from below. (Fig. 4) Individual small branches containing fruit can be protected with an onion sack or similar mesh covering. Row crops, such as strawberries, can be completely covered during the fruiting season. 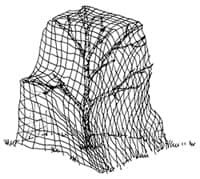 If the netting is to be used for several harvest seasons, it may be worth the extra effort to construct a frame to support the netting. Scare devices, such as pie tins and commercially available Mylar balloons or Mylar scare tape, are known to provide temporary protection. Suspend balloons at least three feet above trees or bushes, or from lines between posts. Use tethers at least three feet long. Attach commercially available red and silver bird-scare tape to stakes and stretch it 18 inches above the areas that need protection, such as newly seeded or planted garden beds. Twist the tape several times before attaching it to stakes so that the visible interval of red/silver is 16 inches. The tape should move freely, so that when a slight breeze blows it will flash in the sun. The space between tapes will have to be no more than five feet to be effective. Because most robins will fly into a strawberry patch, land on the ground between the plants and eat the ripe strawberries from there, scare devices placed above the patch are not effective. Instead, place the scare tape between the rows. The tape should sag slightly but should not be less than three inches or more than five inches from the ground. Scare devices need to be moved weekly (daily if possible) so birds don't become accustomed to them; they are also most successful if put in place before the birds become a problem. Always harvest ripe fruit immediately. If robins are flying into your windows: Many robins are stunned, injured or killed each year when they fly into windows. This unfortunate event seems to occur because the birds have seen the reflection of landscape or sky in the glass, and have the illusion of space beyond the window. Problems with window collisions may increase after a robin has indulged in fermented berries, or when a hawk or other predator appears suddenly and causes a bird or flock of birds to rush to escape. The silhouettes of falcons or owls for sale in catalogs and stores selling bird-feeding supplies rarely accomplish the job of frightening the birds or covering the reflection. Robins quickly lose their fear of a silhouette, and because it covers only a small area, it has little effect on birds heading for other parts of the window. It doesn't matter whether you use silhouettes or any other pattern, as long as you mount the pieces no more than six inches apart. You must put up these pasterns on the outside surface of the window in order to interfere with the reflection; material placed on the inside won't break up the reflection and so won't work. Create bird barriers by covering windows with black bird-netting, available from nurseries and hardware stores. (Fig. 5) From inside the house, the netting will be barely noticeable, and will not impair bird-watching. Rub a bar of soap on the exterior surface of windows, using a design that leaves no area six inches or larger uncovered. Dusty windows also help to cut down on reflection. Turn windows into works of art by installing commercially available window film on the exterior of the windows to give the appearance of acid etching or sandblasting. Install exterior blinds or sun shields. Hang strips of Mylar tape, string, or other material no more than six inches apart on the outside of windows for the full width of the glass. A robin that is able to see the landscape through a window that faces another window is likely to try to fly through the house, crashing into the glass. Closing curtains or blinds on one of the two windows can block the corridor effect. Note: These tips will not completely stop collisions, but they do seem to help prevent at least some of them. 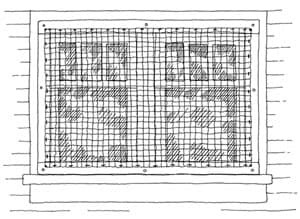 A barrier designed to prevent birds from hitting windows is basically a taut-net trampoline held out about four inches from the glass. Many variations for mounting the net are possible. The simplest is to use thumbtacks to attach black bird-netting from below the eaves to below the windows. Alternatives are to install 1 x 4 inch boards along the top and sides of the window frame. Stretch the netting over the boards, stapling as you go. You may also build a four-sided frame that you can put on over the window, much as you would with a storm window. Are Robins Attacking your Vehicle Windows or Mirrors? Male robins in particular will drive away intruders with great ferocity, and window-attacking birds are more common in the spring breeding season. When males see their own reflection in a window, they may attack. Males have attacked red objects, including socks, handkerchiefs, and other items hanging on a clothesline, and ornaments and discarded toys on the lawn. Apparently they mistake the red object for a trespasser. Although a bird may attack a window repeatedly for days or weeks, usually it does not injure itself seriously. What can you do to prevent these attacks? Some people place small paper sacks over the mirrors of their parked vehicles, or a large protective cover over the entire vehicle. Fortunately, these remedies are generally only necessary during the spring breeding season. Wild birds often get into trouble, either directly or indirectly, because of human activity. People are likely to find injured birds that have struck windows, been hit by cars, tangled in fencing or trellis, trapped in buildings, or captured by free-roaming cats. It is important to remember that, from the point of view of an injured bird, a human rescuer is yet another source of stress. A bird that sits quietly on your finger or in your lap is more likely paralyzed with fear than appreciating your intent to help it. Wild animals do not find human touch soothing. Caring for robins that hit windows or that have sustained other injuries: A robin that hits a window and falls to the ground may simply be stunned. On warm days, it is best to leave the bird alone; it will likely fly off after a few minutes. However, if the weather is cool or if there are cats nearby, pick the bird up immediately. Stunned birds are subject to hypothermia and many cats recognize the sound of a bird striking a window and will quickly come investigate. Place the bird in a box that has been lined with an old towel or piece of clothing; the box should have air holes and be covered and placed in a warm, quiet place away from children and pets. Do not put food or water in the box. When you hear the bird moving, open the box outside near a tree or shrub and leave temporarily to give it a chance to fly away. Be sure to wash your hands after handling any wild bird. If the bird does not fly off after a few minutes, contact a local wildlife rehabilitator. "Good Samaritans" may rescue birds in distress, but must transfer them immediately to a wildlife rehabilitator who has the proper state and federal permits. Rehabilitation permits are not "just a legal formality." They are issued to people who have demonstrated knowledge regarding wildlife nutrition, husbandry, injury, parasites, disease, etc. and who have appropriate housing facilities for wild animals. If you are unsure whether a bird you have observed needs rescue, call your local wildlife rehabilitator to discuss the situation. It is important to call the wildlife rehabilitator before you take an injured bird to the facility to ensure that they have everything on hand that they will need when the bird arrives. Birds that have been bitten by cats need help immediately. Cat saliva contains bacteria that is usually fatal to birds unless appropriate antibiotics are administered very soon after the injury. Cat predation is a major threat to bird populations, especially those already on the decline due to habitat loss. Please keep your cats inside, for the safety of both your pets and the birds. For more information, see the Cats Indoors! Campaign, sponsored by the American Bird Conservancy. Caring for immature robins: If you find an immature robin on the ground but its parents nowhere in sight, look at whether the bird is partially feathered and can perch and fly (even clumsily). 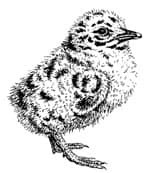 If the answer is yes, then this bird is a fledgling and is likely being cared for by its parents. These young birds typically leave the nest and move about on the ground and on low branches for a few days before they can fly. (Fig. 6) The parents will not approach their fledgling to feed it if humans are nearby. In this case, you should leave the bird alone and allow its parents to return to feed it. If you find a nestling robin (one that is not feathered and cannot perch or fly even clumsily, Fig. 7) whose parents are known to be dead, or that is cold, wounded, surrounded by flies, has been exposed to sun or rain or left for an extended period of time, the bird may need help. The unfeathered nestling will first need warmth. Place it in a box that has been lined with an old towel or piece of clothing; the box should have air holes and be covered and placed in a warm, quiet place away from children and pets. To provide additional warmth, place the box on a heating pad set on low or medium. Do not put food or water in the box. Contact a local wildlife rehabilitator who can provide further care. Be sure to wash your hands after handling any wild bird. Robins are federally protected under the Federal Migratory Bird Treaty Act. Any permit to lethally control these species would need to be issued from the U.S. Fish and Wildlife Service, and would only be issued in very extreme cases. It is a violation of state and federal law for members of the public to hold American robins, as well as most species of wild birds, in captivity. Written by: J.L. Dunn, and J. Alderfer, ed.